Pamplin Media Group - Which way now for Derek Anderson? 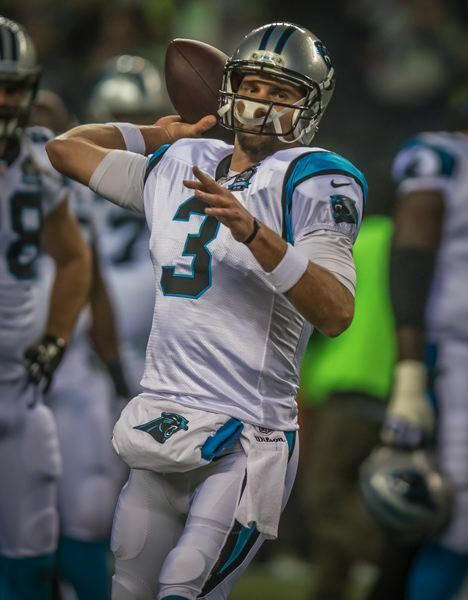 Which way now for Derek Anderson? Derek Anderson is pretty sure he'll be playing for an NFL team next season. He's just not sure which one. The former Scappoose High and Oregon State quarterback becomes on unrestricted free agent on March 14; after that, agent David Dunn will work to find a team for Anderson to play on next fall. For the past seven seasons, Anderson has been backup to Cam Newton with the Carolina Panthers. What is the chance Anderson will re-sign with the team? "I think it's pretty good," he says from his home in Scottsdale, Arizona. "I spoke with Ron (Rivera, the head coach) before I left Charlotte (in January). He gave me a pretty good indication they were going to try to bring me back. "There are going to be some other opportunities out there, and I'm not 100 percent sure how we'll navigate through it. We'll see." Anderson, who turns 35 in June, has made more than $30 million in salary in his 13 seasons in the NFL. Not bad for a guy who was taken by Cleveland in the sixth round of the 2005 NFL draft. He started 43 games over four seasons for the Browns, including 15 during a Pro Bowl 2007 season when, as a second-year pro, he threw for 3,787 yards and 19 touchdowns. Since Anderson arrived in Charlotte in 2011, though, playing time has been sparse. That was Newton's rookie year, and Newton has been the starter ever since. In four starts and 23 appearances over seven years, Anderson has completed 111 of 174 passes (.638) for 1,265 yards and seven touchdowns. Through those years, the Panthers have averaged more than nine regular-season wins and reached the 2016 Super Bowl. This past season, they went 11-5, but lost 31-26 to New Orleans in a wild-card playoff game. "It has been an awesome spot for me," Anderson says of Carolina. "It has by far one of the best-run organizations in the league. We've won a lot of games. It is a very family-oriented place. I've made a lot of great friends there. I've built a lot of great relationships. If I don't end up going back, at least I got all that out of the deal." Anderson says his time as Newton's understudy has been "fantastic." "He has been nothing but great to me and my family," Anderson says. "We talk and text a lot. He's a great friend. It's been awesome watching him grow and to see the ups and the downs he's gone through to get to where he's at today." It has been eight years since Anderson was a starter in the NFL. Could he still do it as he approaches 35? "I can start games," he says. "I can win games. I don't think at this point that anybody is going to bring me in to be the opening-day starter. I could be wrong, though." How hard has it been to get on the field so infrequently the past seven years? "Sometimes it's hard," he says. "All you can do is put the work in and go through the week and have yourself as prepared as possible going into the game. I've done a fairly good job. When I get an opportunity to play, I've played pretty well. I have a routine during the week that prepares me for when I do have to play. I've learned to embrace that role. "And there are other things that are important to me as I get older, like helping the young guys through the week. I have a larger role than just preparing myself. Last season, we had a ton of young receivers and skill guys. Christian McCaffrey ( a rookie last season) is an example. He is always bouncing things off me. I've tried to help him grow and give him confidence and a better understanding. The NFL game is far more complex than most of us had in college." In a way, Anderson lives vicariously through Newton's on-the-field exploits. "I get so much pleasure out of watching Cam do something we talked about in the meetings during the week, watching him execute plays or see a blitz," Anderson says. "It's great to have one of our young guys do something we worked on during blitz drill in practice. I guess I go into my teacher mode." Anderson knows he is nearing the end of his career. "I'm going to try to go two more years," he says. "If everything lines up, I'll shut it down after that." Anderson isn't sure if he wants to coach after his retirement as a player. He and wife Mallory have three children ages 3, almost 2 and six months. "I think I would enjoy it, but I've always said I'll cross that bridge when it comes," he says. "I'd have to be 100 percent committed to it. I know I want to be around my kids. By that time, I'll have earned the right to have that time with them. You miss so much because of the time commitment in coaching. That's something I'll have to think about." The Andersons divide the offseason between Scottsdale, Arizona, and Salem, where they keep a home they generally inhabit from mid-May until training camp begins in late July. The Salem house is in the same neighborhood as that of Bill Swancutt, his close pal and former OSU teammate. "I was just was up there last week and had a good visit with Swannie," Anderson says. There are those who believe the long-hitting Anderson — a member of Scottsdale's Whisper Rock Golf Club and once a scratch handicap — is the best golfer in the NFL. "Not currently," he says with a chuckle. "My game has been a bit of a struggle lately. I'm more like a 2 (handicap) right now. Had a tough month last month. Before we had a million kids, I played a lot more. I've played maybe 20 times since we got here in January." Anderson recently had lunch in Scottsdale with OSU athletic director Scott Barnes. "He's a super good dude," Anderson says. "It was a good meeting. Sounds like we have things going in the right direction." Anderson was backup to new OSU coach Jonathan Smith when Smith was a senior and Anderson was a true freshman for the Beavers in 2001. "Smitty's going to do a great job," Anderson says. "He knows what kind of kids we need to bring into that situation. He has seen success there as a player. He knows it's going to be a battle early on. But once you start winning games and get people rallying around, things will turn around a lot faster than people might think."